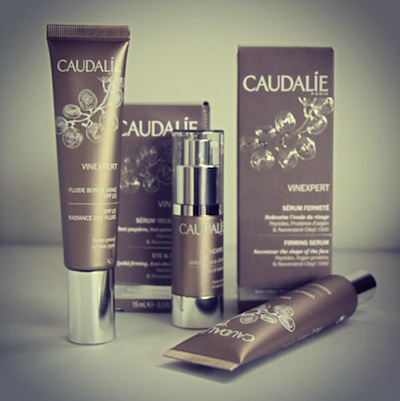 Caudalie have relaunched their Vinexpert range with some very swish new packaging. It really stands out from the other ranges; it looks much more modern and high-end – with the exception of the Premier Cru serum and eye cream, which have always been very swooshy. It certainly takes a more attractive picture – I’m quite pleased with my atmospheric still-life! I love the textures of the Vinexpert products – a tiny amount of the serums (one for the face, one for eye and lip) go a very long way and they’re a perfect little pre-moisturiser addition to any regime. Perhaps, though, the most beneficial product in terms of long-term protection would be the Creme Bonne Mine SPF15. Sun protection really is key for keeping the skin looking youthful (and healthy) and this daytime moisturiser is more than adequate for a typical British day. It sits well beneath makeup, but if you have oily or combination skin then try the fluid version instead – it has an instant glowy sheen without looking greasy. In summary, I’d say that this re-launch is a nice addition to Caudalie’s ranges – tackling lack of firmness and providing ongoing protection, it could be a good option for those hitting their thirties (or later) and feeling a slight loss of tone. There are no exfoliating products in this range but that could actually make it a nice one to fit in between days when you use peels or overnight exfoliants.